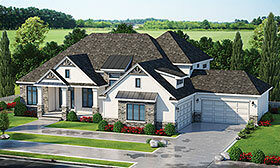 The modern-farmhouse plan is a study in elegance, from its captivating exterior through its inherent livability. With such spacious areas inside and out, on the main floor as well as the lower level, entertaining is suited to any occasion – and the 25-foot deep theatre makes movie night truly special. The perfect retreat, the owner’s suite rewards with intricate ceiling details in the bedroom, an inspired walk-through shower and soothing tub in the bathroom, plus an indulgent closet with 4-foot by 5-foot island. Even your pets have been accommodated in this design with finished basement plan included! 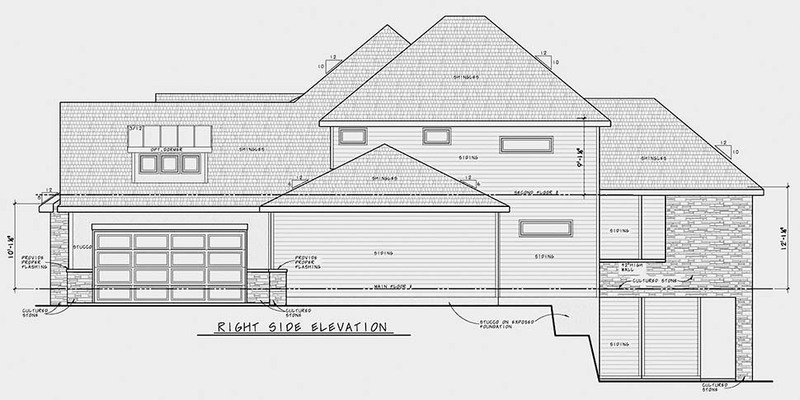 Each home plan features the rendered elevation and informative reference sections including: general notes and design criteria; abbreviations; and symbols for your plan. Drafted at 1/4" scale. Poured or block basement or slab foundations are standard. We also show the structural information, steel beam and pole locations and the direction and spacing of the floor system above. Optional basement, slab and crawl space foundations are available. 1/4" scale. Dimensioned from stud to stud and drafted to the same degree of detail as the main level floor plan. Illustrated on a separate page for clarity, the electrical plan shows suggested electrical layout for the foundation, main and second level floor plans. Typical wall, cantilever, stair, brick and fireplace sections are provided to further explain construction of these areas. Illustrated on a separate page for clarity, the roof framing plan shows the suggested dimensional plan showing lengths, runs, ridge heights and wall plate heights.